Only a couple of weeks after a hugely successful sold out inaugural Breaking Bands Festival in 2015, the organisers instead of taking it easy and soaking up the success, have been hard at work already planning next year’s one. 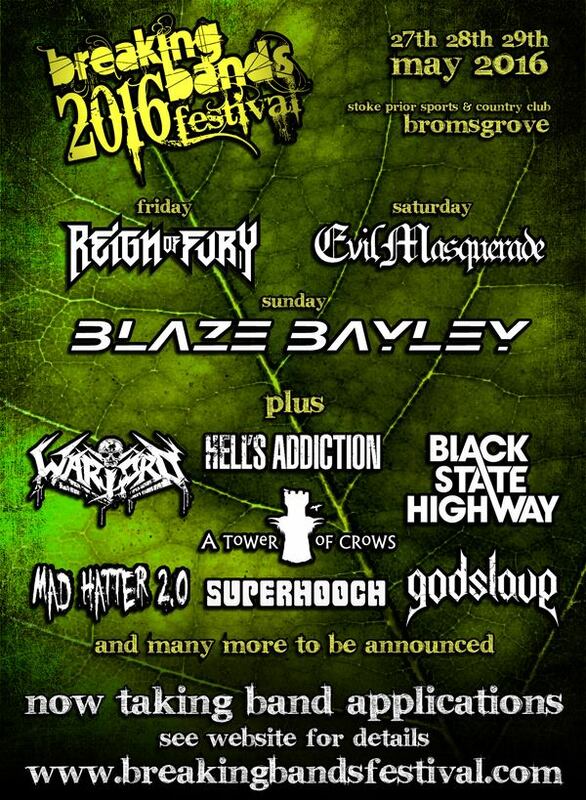 As well as the previously announced headliners Reign of Fury, Evil Masquerade and Blaze Bayley, 7 more bands have just been announced. The event will again be at Stoke Prior in Bromsgrove from Friday 27th – Sunday 29th May 2016. Already bringing back 2 bands by popular demand after excellent sets from them, A Tower Of Crows and Black State Highway will be returning again next year. As many bands supported the new festival even though they weren’t playing, Mad Hatter 2.0 who have been on hiatus waiting for this opportunity will this time be taking to the stage, along with stoner blues band Superhooch. With a mixture of styles across the 3 day event, the first of the heavy side of metal bands will be Warlord UK as well as a band coming over from Germany, Godslave. Hell’s Addiction will also be playing the festival in 2016. RARC attended one of the days this year, which was billed as the “festival to discover your new favourite band” but it was such an excellent event, with a brilliant atmosphere, an entire 3 days of outstanding bands at the incredibly low price of just £25 for the entire weekend, along with the most reasonable food and drink prices ever known at an event, every aspect of this exceptionally well organised event meant that everyone there in fact found their new favourite festival and not just a new band. We can’t recommend it enough as the best festival ever attended. More announcements will be made in the future and you can keep up to date on social media and via the website.